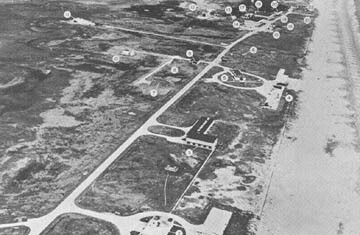 The NACA used and was used by its facilities. 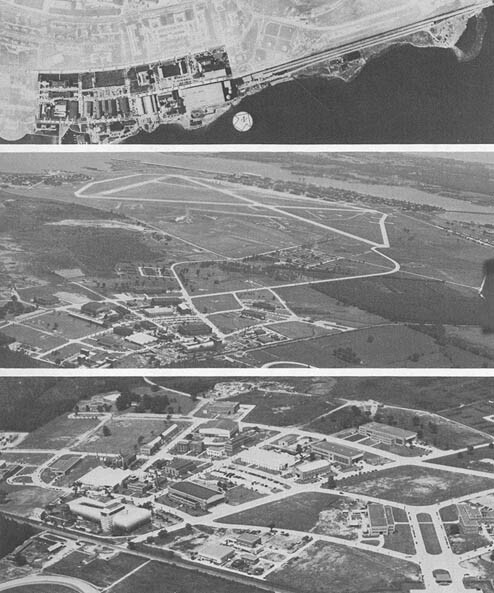 For many years the NACA had the best aeronautical research facilities in the world, and in many ways these facilities determined what the NACA would choose to do and be required to do. 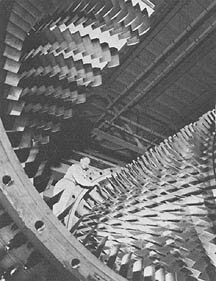 Having the world's only full-scale wind tunnel enabled the Committee to perform unique experiments, but it also dictated that the research program make full use of the full-scale tunnel. 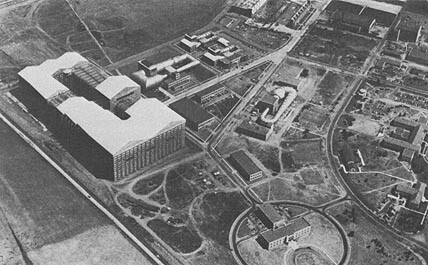 The same was true of the NACA's other research facilities, so that the agency waged an unending campaign to coordinate the needs of aeronautical research with full exploitation of the equipment on hand, retirement of old equipment, and development of new. State, War, and Navy Building, Constitution Avenue, N.W. Munsey Building, 1329 E Street, N.W. Bureau of Aircraft Production, Building D, 4th Street and Missouri Avenue, N.W. Leiter Mansion, Dupont Circle, 1500 New Hampshire Avenue, N.W. Wilkens Building, 1512 H Street, N.W. A fundamental law of fluid dynamics is that a body immersed in a moving fluid experiences the same forces as if the body were moving and the fluid stationary, given that the relative speed of the fluid and the solid object is the same in both cases. This means that the conditions surrounding an airplane in flight can be replicated by holding the plane stationary and moving the air past it at a velocity comparable to flight speeds. Thus, wind tunnels. Advantages of wind tunnels over flight-testing are economy, safety, and research versatility. A model airplane can be tested in a wind tunnel at a fraction of the cost of building and operating a full-scale prototype, and the airworthiness of new and experimental designs can be tested without risking a pilot's life. Wind-tunnel testing can simulate flight under conditions more controlled and measurable than would be possible in flight test. Even before man first flew, the wind tunnel was the principal tool of the aeronautical engineer. All wind tunnels have common features that circumscribe their characteristics and capabilities. All have a test section in which an airplane model or component-or even a complete airplane-can be fixed or suspended. The cross section may be round, oval, rectangular, or polygonal. Test sections may vary in size from a few inches up to the 40- by 80-foot dimensions of the Ames full-scale tunnel, still the largest in the world. * The test section may be open, closed, or ventilated. Wind tunnels may be either return or no return. No return tunnels draw air from the atmosphere, pass it through a tube that includes a test section, and discharge it into the atmosphere. Such tunnels are simple and inexpensive to build, but are inefficient and limited in the types of flow they can generate. Most sophisticated tunnels use a return-type circuit in one of three basic variations. The single-return tunnel passes the same air around a closed loop. Many such tunnels are designed so that the laboratory building encompasses the test section, with the rest of the tunnel winding a circuitous path outside like an overgrown appendage. The double-return tunnel is shaped like a squared figure-eight with the corners rounded and the test section located at the juncture of the two loops. Annular-return tunnels are doughnut-shaped in cross section. Longitudinally, they look like a tube within a capsule; air pushed around the inner shell of the capsule is channeled down the tube in the center, which contains the test section. Annular-return tunnels are generally small and entirely con-tained within their research building. ....speed of the fluid, and inversely proportional to the viscosity of the fluid. Other things being equal, a model "moving" with respect to an airstream would have a smaller Reynolds number than a full-scale plane in flight. The easiest way to equalize the Reynolds numbers-and thus to obtain comparable flow conditions for the plane and the model-is to increase the speed or density of the airstream in which the model is immersed. To increase airspeed within a wind tunnel is a complicated and expensive undertaking that would violate equality of the ratio of airspeed to speed of sound, another condition for strict comparability. In a return-type tunnel, however, it is comparatively easy to increase air density by increasing air pressure. The NACA's first pressurized tunnel-Max Munk's variable-density tunnel of 1923-could pressurize the air to 20 atmospheres, making tunnel results on a 1/2oth-scale model comparable to those of a full-size plane in the atmosphere. **Mach no. equals stream velocity/velocity of sound. As aircraft speeds increased, wind-tunnel speeds had to increase. Above 300 to 400 mph, the compressibility of air begins to affect the results of scale-model tests. Thereafter, not only the Reynolds number but also the actual mach number must be matched between the model and the aircraft. A plane moving through the air at low speed sets up something like a bow wave, a layer of compressed air at the leading edges that moves ahead of the plane at the speed of sound, pushing the approaching air out of the way. When the plane moves near or above the speed of sound, the air has no time to get out of the way, and its collision with the plane produces shock waves-patterns of energy dispersion-with unique aerodynamic effects. High-speed wind tunnels are expensive to build and operate (the power required increases as the cube of the speed) and present major problems in turbulence, heating, and flow condensation, but they are indispensable to accurate testing in high-speed regimes of flight. Some of the NACA's greatest achievements were the development and application of high-speed tunnels, especially in the anomalous transonic region. In most conventional wind tunnels the air is moved by fans powered by electric motors. Some tunnels, however, produce the airstream differently: Blowdown tunnels use a jet of air from a pressurized reservoir. Induction tunnels use a stream of air flowing into a vacuum chamber. Hypervelocity tunnels may combine these methods, passing air from a pressurized vessel across the test section and into an evacuated vessel at pressure ratios of several hundred. Although blowdown and induction-drive systems can produce extremely high-velocity air, they are severely limited by the brief availability of that air and their limited ability to modulate the velocity. At the extreme end of the spectrum is the counterflow tunnel in which a model is shot from a gun into a high-velocity airstream from a blowdown or induction-drive system. 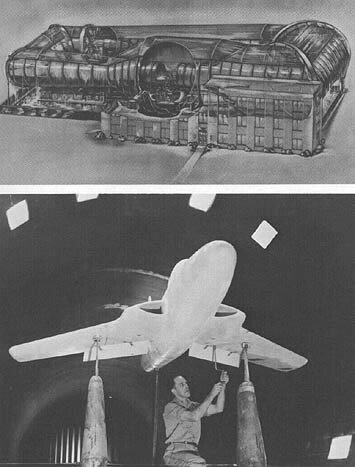 Some wind tunnels in the NACA laboratories shared drive systems, and some blowdown tunnels used compressed air stored in nearby pressure tunnels. These basic characteristics, common to most wind tunnels, by no means encompass all the features, capabilities, and equipment involved in wind-tunnel research. Almost all wind tunnels employ a complex array of balances and other measuring devices designed specifically for the purpose. Most closed-circuit tunnels use tunnel vanes to guide the airflow smoothly around the corners in the circuit. Most tunnels use complex arrays of settling chambers, screens, and throat contractions to smooth and straighten the airstream as it accelerates into the test section. A variety of model-support systems is used, depending on the configuration of the test object. Some  tunnels use smoke to help visualize air flow. Some are rigged for Schlieren photography, a special technique that records shock waves produced at high speeds. Some tunnels are refrigerated to produce ice on the models like that encountered under certain flight conditions. In fact, wind tunnels have been designed to replicate nearly every condition encountered by airplanes in flight. There are vertical wind tunnels to study aircraft spinning characteristics, gust tunnels to determine the effect of fluctuations in the airstream, and curved-flow tunnels with variable geometry in the test section to determine flight characteristics in turns or maneuvers. There are even free-flight tunnels in which the model floats free and the test section cants to simulate different angles of attack. The characteristics of a tunnel are not necessarily fixed permanently during construction. Many NACA tunnels saw long and varied service, upgraded to incorporate advances in wind-tunnel technology that adapted them to modern regimes of flight. The most frequent modification was repowering to produce higher velocities in the test section. Improved instrumentation and mountings were less dramatic but equally important. ....and drive systems of all major NACA tunnels. Cost information is not sufficiently reliable to merit inclusion, but one example will suggest the range of expenses involved. The first NACA wind tunnel (the 5-foot atmospheric tunnel built at Langley in 1920) cost about $45,000. The 10-by 10-foot supersonic tunnel built at Lewis in the early 1950s cost $35,000,000. The wind tunnel that dominated NACA research could not provide all the answers the Committee needed to solve the problems of flight. Over the years the NACA constructed other research laboratories, buildings, and equipment to answer questions not aerodynamic in nature. These facilities are especially hard to trace because they frequently had no building of their own but occupied space in office buildings that housed a number of research functions. No attempt has been made to inventory these facilities in the same detail as the NACA wind tunnels, but a list of major nontunnel facilities at Langley may indicate the great variety of NACA equipment. Langley had more of these facilities than any other laboratory or station. Note the rapid tempo of expansion of facilities during World War II, a measure of the NACA's concentration on wind-tunnel research in the 1920s and 1930s. And compare the small number of these with the extensive family of tunnels described in the following section. Drive system: 200-hp (149-kw) electric motor/fan Operational date: 11 June 1920 Disposition: Dismantled in 1930 Notes: Modeled after an early tunnel at the National Physical Laboratory in Britain; primitive for its time. Disposition: Dismantled in 1950 to make way for 8-foot Transonic Pressure Tunnel. and construction begun in 1925. Notes: Underwent major rehabilitation in 1977 with no change in performance. Notes: Successor to the 12-inch open-throat tunnel designed in 1927 and operated 1928-1932.
photographs at LMAL; enclosure installed 29 Aug. 1949. Notes: Modeled on British tunnel of 1932. Notes: The only NACA tunnel with external concrete walls, constructed with WPA funds; repowered in Feb. 1945 to 16,000 hp, M 1 capability; slotted throat installed in 1950; increased to 25,000 hp in 1953 to yield M 1.2; the tunnel used to verify the area rule. Notes: Designed by John F. Parsons under Smith J. DeFrance for high Reynolds-number research on problems of low-speed high-lift stability and control; converted to transonic dynamics tunnel in 1954. Notes: Undertaken in 1937 on the basis of success of the 5-foot free-flight tunnel; inclination and airspeed of tunnel matched to normal glide pattern of model. Notes: Designed by Eastman Jacobs and Ira Abbott; operated briefly with freon gas as the test medium. Still operational. Notes: Repowered in 1950 with 60,000-hp drive and 14-foot slotted test section (M 1.1); in 1969 added 35,000-hp plenum suction blower (M 1.3). Virginia Polytechnic Institute in 1958. Notes: Adjustable nozzle abandoned in favor of fixed nozzle. Notes: Designed for research on aircraft loads produced by atmospheric turbulence. Notes: Two test sections: 7- by 10-foot-300 mph; 17- by 15.8-foot- 8 mph. Notes: Slotted test section installed, capability to M 1; connected to 35,000-hp compressor of 16-foot transonic tunnel for transonic operations, M 1.2. Notes: Proposed by John Becker as forerunner of supersonic tunnel; pilot model for 5-0 mach tunnel; electric resistance heater raised temperature in settling chamber to 900° F.
Notes: Repowered in August 1950 to 45,000-hp, 2.5 atmospheres pressure, M 2.6. Notes: Blow down from low-turbulence pressure tunnel, 150 psi. Test section, circuit/pressure, maximum speed, drive system: Central 3,000 psi (204 atm) tank farm provides heated air to several small blow down tunnels. Mmax with air is 8. Notes: Plenum suction added in 1958-increased speed to M 1.3. Notes: Two separate test sections: low, M 1.5 to 2.9; high, M 2.3 to 4.6. Notes: Running time was 75 sec at 50 psia, 18 sec at 200 psia; hot core capability added in 1963 by propane burning; closed by rupture of 600-psia tank farm in 1971. Notes: A workhorse tunnel for inlets and complete models. 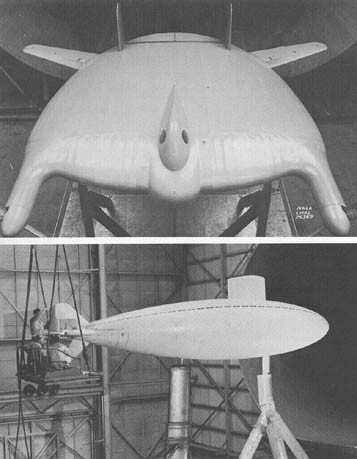 Notes: Repowered in 1955 to 110,000 hp (82,060 kw) with 14- by 14-foot (4.3 m x 4.3 m) transonic test section, M 1.2. Notes: Power increased in 1979 to 135,000 hp (100,710 kw), M 45; 80- by 120-foot leg (24.4 m x 36.6 m) added. Notes: Exceptionally low turbulence level. Notes: Modified in 1956 to provide subsonic/transonic capability, M 0.3 to 2.2. Notes: Projectile fired upstream; produces shadowgraphs. Notes: Drive motors shared with supersonic legs. Notes: Common drive leg with 8- by 7-foot supersonic tunnel; drive motors shared with transonic leg. Notes: Drive leg shared with 9- by 7-foot supersonic tunnel; drive motors shared with transonic leg. Notes: Low-energy start via double-hinged fixed-contour nozzle blocks; boundary layer control at second throat. Notes: Adjustable flexible-wall nozzle ahead of test section. Notes: Run duration, 180 milliseconds; converted in 1967 to 42-in, shock tunnel. Notes: Designed for altitude propulsion-system testing; used after 1958 as a rocket test cell. Notes: 2,100-ton refrigeration system cools tunnel air to -40°F (4°C): water sprays provided. Notes: Converted to open/closed return; added transonic section and vertical takeoff and landing section. M 0.36 to 2.0 (primary test section). Notes: Designed for propulsion-system testing; can be run open to the atmosphere. *At the time of this writing, the tunnel was being modified to provide an 80- by 120-foot test section. 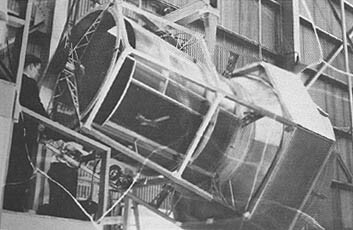 Unless otherwise indicated, all data on the NACA wind tunnels was derived from Donald D. Baals and William R. Corliss, Wind Tunnels of the National Aeronautics and Space Administration (SP-440; Washington: NASA, 1981). 1. Research and Development Board, Committee on Aeronautics. "U.S. and Foreign Wind Tunnels in Operation, under Construction, or Authorized," AR 26/11.5, 4 Feb. 1948. 2. The Working Committee of the Aeronautical Board, "Survey of Wind Tunnels," preliminary copy, 1 Jan. 1947. 3. 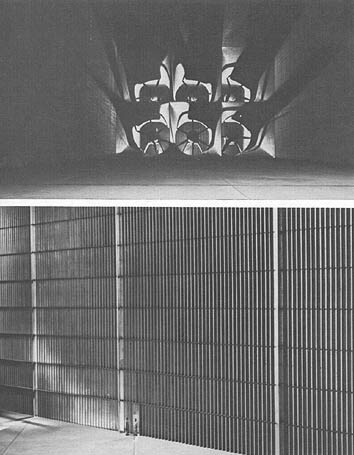 Alan Pope, Wind Tunnel Testing (New York: John Wiley and Sons, Inc., 1947), pp. 16-29. 4. Bernard A. Goethart, Transonic Wind Tunnel Testing, ed. by Wilbur C. Nelson (New York: Pergamon Press, 1961), pp. 383-89.